If you’ve watched an NFL football game in the last month or so, chances are you’ve heard Richard Sherman’s voice. 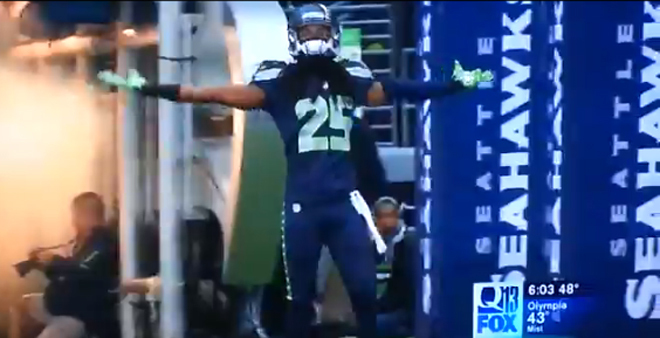 A starting cornerback for the Seattle Seahawks, Sherman is one of the best in the game, and he lets you know it, too. His letting Fox’s Erin Andrews know it following the Seahawks’ 23-17 win over the San Francisco 49ers Sunday has been the subject of all this week’s NFL buzz. 1. He’s a Compton native. Sherman grew up an Angeleno and attended Dominguez High School, the same school that once housed basketball greats like Brandon Jennings, Tayshaun Prince, and Tyson Chandler. 2. He’s quite the academic. Dominguez High was, for a brief time, taken over by the state for academic troubles, but Sherman thrived in the classroom. He finished his high school career with a 4.2 GPA—second in his graduating class—and scored an impressive 1400 on his SAT (before the writing section was a thing). 3. He once spurned his current coach. Sherman was a talented Los Angeles football recruit. Then-USC coach Pete Carroll had a stranglehold over the Los Angeles recruiting scene. So Sherman became a Trojan, right? Wrong. Despite interest from USC, Nebraska, Colorado, and others, Sherman chose Stanford and a new coach by the name of Jim Harbaugh. 4. He was once a wide receiver. 5. He’s a man of charity. Last year, Sherman launched Blanket Coverage—The Richard Sherman Family Foundation. The non-profit’s goal? To make getting an education easier for underserved children and “help as many kids as possible have adequate school supplies and clothes,” according to the organization’s Facebook page. 6. He has a sense of humor. After the Seahawks’ early-postseason exit last year, Sherman didn’t go home and sulk. Instead, he took to Bourbon Street in New Orleans, asking fans who they thought was the better corner in the NFL: Richard Sherman or the Bucs’ Darrelle Revis. Some caught on, some didn’t. 7. He did shut down Michael Crabtree. In the Super Bowl, Sherman will face wide receiver Demaryius Thomas and the arm of Peyton Manning. Who punks who is yet to be determined.